Gives administrator ability to block certain usergroups to create new threads until they achieve specific amount of posts along with ability to bypass the restriction in specified forums. Description: No New Threads plugin allows to block certain usergroups to create new threads until they achieve specific amount of posts. You can also specify which usergroups can bypass this restriction. Also comes with a flexibility of allowing restricted users to post in certain specified forums without having the specified required posts which is very useful if you want you let them post threads in forums like Suggestions or introductions. v1.1 - Added in the errormessage how much posts user has and how much more he requires to be able to post threads, and fixed some bugs. 2. Upload nonewthreads.php inside the inc/plugins/ folder which we just extracted now to (root)./inc/plugins directory of your website's server. 4. Go to ACP and activate it. 5. Next, proceed to Settings > Configuration and find No New Thread settings and configure settings. 1. Not distributed under GNU/GPL. 2. You may modify the codes or plugin for your personal use but cannot claim it to be own or remodify and sell or reproduce under any cirumstances. 3. Free to edit for personal use but not distributing to plugin by modifying any codes. 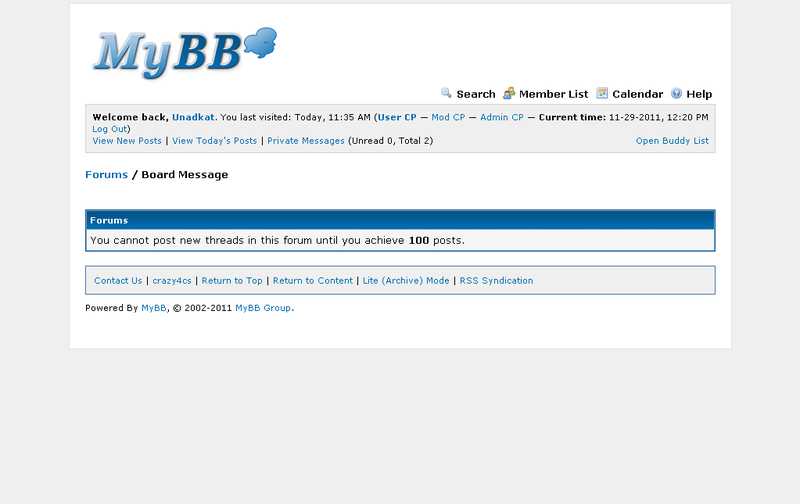 I can be reached via my website or MyBB Community Forums.